Having engraved a profound spot in smart technologies industry, light field market in the recent years is rightly riding on the cusp of major breakthroughs that are transforming the future of media. Light fields are in fact forming an integral part of the popular concept of virtual reality (VR) and augmented reality (AR), as they genuinely represent how light exists in the real world and how human eye perceives it. This has propelled the light field market to gain heavy momentum in the ever-evolving media, entertainment, and gaming industry. Estimates claim that, owing to broad applications of light field in theaters, gaming, museums, fun zones, and amusement parks, the media & entertainment segment accounted for a significant 25% share in 2017 and is further projected to grow at a healthy rate. Interestingly, the gaming industry is currently growing at an incredible rate and with several industry players developing AR/VR featuring games such as Crime Scene AR, Fury of the Gods, and KnightFall AR, the light field market is certain to garner lucrative proceeds. 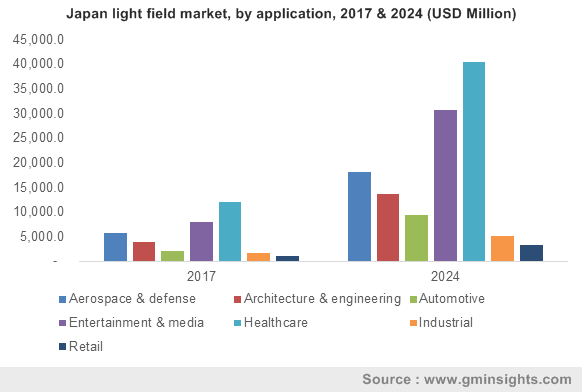 Given the high adoption of this technology in these applications, estimates claim that gaming application segment to be one of the most profitable growth avenues for the global light field industry share in the ensuing years. Furthermore, the growing demand for HD picture quality that is said to enhance the overall viewing experience and user interactivity with screen is driving the market size. It has been reported that light field provides enhanced features and scene resolutions in comparison to the traditional video and image qualities, and this as triggered several light field industry players to come up with technologically advanced features. Recently for instance, Raytrix GmbH, a German company introduced C42i series with high-resolution capacity of 42 MP (megapixels) with pixel ratio of 7716 x 5364. Such high-quality and high-definition cameras are gaining immense traction, as it has the ability to capture 3D particle spots and velocity in a volume over the traditional cameras. In yet another instance, CREAL3D, a Switzerland-based startup demonstrated an impressive light-field near-eye display for VR and AR headsets at CES 2019. If reports are to be believed, the light-field display system can support 100s of depth-planes from zero to infinity with logarithmic distribution. The company expects that they can have their light-field displays ready for virtual reality headsets this year and can readily shrunk the systems to fit glassed-sized AR headsets by 2021. If reports are to be believed, VR and AR technologies are witnessing high adoption rate in Latin America, given the strong proliferation of automotive, retail, and hospitality application segments. Analysts claim that the rapidly progressing retail & automotive sectors, particularly across Brazil and Mexico, have been the key factor fueling regional light field industry share. These sectors are actively leveraging VR & AR technologies to enhance customer experience as well as brand engagement factor. The regional stores are bringing forth new interactive shopping devices which incorporates mixed reality headsets to enhance customer viewing and buying experience. Speaking along similar lines, several retail and apparel stores are taking advantage of this cutting-edge technology to provide customers with a provision to try various cloths virtually, without having to wait in the queue for trail rooms. Rising adoption and implementation of such shopping experience with the help of AR & VR in various stores have in turn fueled the regional light field industry share in the recent years. Furthermore, strong presence of tech companies and industrial players in the region is also boosting the product demand. If estimates are to be believed, Latin America light field market is anticipated to register a double-digit growth rate of 16% over 2018-2024. Considering these aforemention trends, it is quite overt that the light field technology has a wide scope for expansion, given the continuous advancements and innovation in VR/AR/MR products, electronic components as well as other camera and display technologies. Light-field display is further gaining massive attention from image solution processes, 3D mapping, 3D scanning, image construction, 3D rendering, animation etc., and the global light field market is thus certain to paint a promising picture in the coming years. A presumption validating the same is of Global Market Insights, Inc., that claims the light field market to hit a valuation of USD 1.5 billion by 2024.